When I originally made the Salted Caramel Sauce, it was for these cupcakes. I was going to make them for Scott's birthday. Because we were out of town the weekend before his birthday, we are celebrating his birthday and our friend, Joanna's, this coming weekend. I got a huge jar of Salted Caramel Sauce when I made it, so I had plenty for the Banana Oat Muffins with Salted Caramel Drizzle , the Salted Caramel Apple Cake with Fresh Apples, the Oatmeal Apple Cookies with Salted Caramel Drizzle or Not, and lastly Dark Chocolate Cupcakes with Salted Caramel filling, Vanilla Butter Cream Frosting, and Salted Caramel Drizzle. September has been the month of Salted Caramel Sauce for sure, and I still have two small jars of sauce, which I'm giving away. I never imagined that I would have gotten so much, luscious thick, gooey caramel sauce from one recipe. Thanks, Monet for sharing this recipe. These are magnificent cupcakes with lots of dark chocolate with cocoa and melted dark chocolate chips and Salted Caramel Filling. 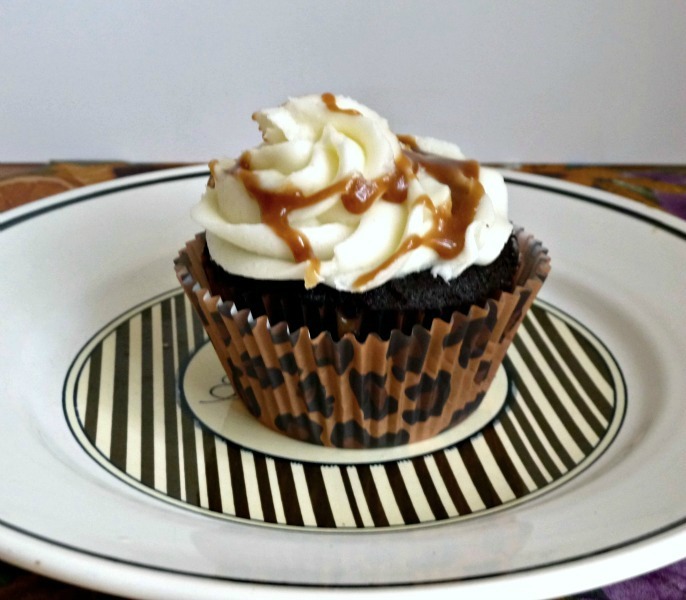 I didn't want Caramel frosting with the Caramel filling and drizzle, because the cupcakes would be too sweet. I opted for a Vanilla Butter Cream topped with just a touch of Caramel Drizzle. I had to taste one of the extras, which was so good; rich, chocolatey, and full of luscious caramel. I'm sure that the birthday guests will love them. 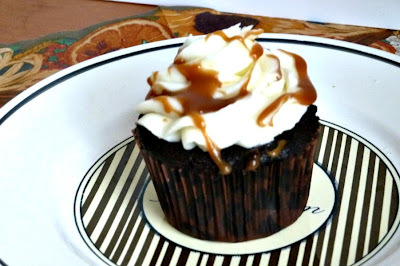 Dark Chocolate Cupcakes with Salted Caramel Filling and Vanilla Butter Cream Frosting and Caramel Drizzle. 4. Whisk eggs in second medium bowl to combine; add sugar, vanilla, and salt until fully incorporated. Add cooled chocolate mixture and whisk until combined. .Add in one third of dry ingredients to egg sugar mixture, alternately with the milk, and ending with the dry ingredients, until well combined. 5. Divide the batter evenly among muffin pan cups. Bake until pick inserted into center of cupcakes comes out clean, 18 to 20 minutes. 6. Cool cupcakes in muffin pan on wire rack until cool enough to handle, about 15 minutes. Carefully lift each cupcake from muffin pan and set on wire rack. Cool to room temperature before filling and frosting. about 30 minutes. 1. Attach a candy thermometer to a heavy saucepan. In saucepan, bring butter, brown sugar, corn syrup, and sweetened condensed milk to a boil over medium heat, stirring with a wooden spoon. this may take several minutes. 2. Carefully and slowly stir in whipping cream. Be careful, cream will boil rapidly and can burn. 4. Remove from heat and add vanilla and salt. 5. Store in a glass jar after the mixture has cooled slightly. If your caramel is too hot, there is the risk of glass breaking. Note: As caramel cools, it thickens. If you aren’t using caramel right away, you can store for 1-2 weeks in a glass jar. When you’re ready to enjoy your caramel, spoon out a chunk (yes, it will be that thick), add a dash of cream, and then microwave in 15 second increments until smooth, or over a double boiler, just above the simmering water. Use a paring knife to cut a cone-shaped piece (about 1/2 inch deep) from the center of each cupcake and throw away the pieces, eat them, or use a cupcake corer. I used the cupcake corer. Spoon caramel filling into the cupcake. Frost with Butter Cream and drizzle with more of the Caramel sauce!! Enjoy! These cupcakes are good, but Monet's Caramel Sauce is wonderful, and you get a huge amount. Get your jars ready! Good lord woman this for breakfast would be sheer bliss right nnow it's 7:am love this drizzling sauce! I'm more than willing to look past the whole chocolate thing in order to get to that caramel! They look delicious. Happy birthday to Scott! Going past the chocolate to get to the caramel, would be worth it for you. these cupcakes are wickedly good. I'm over here snickering right now at the caramel thing because can you believe I was actually considering making another caramel recipe. I like how you mixed it up with the chocolate and vanilla. Happy Thursday! How did we get on the same caramel wave length? I'll call you, maybe? Great minds do truly think alike. These cupcakes look so complex and gourmet yet super delicious and comforting and yummyyyy! I don't know if these cupcakes are complex or not, I just know how sinfully good they are. Hi Becky, oh my.... the name itself already so tempting. It sure taste heavenly and it look soooo good. Wish I can one or two right now. Lovely cupcakes, thanks for sharing these awesome recipes. You wouldn't be disappointed, if you made these yummy cupcakes. Every flavor in these cupcakes is amazing and decadent, but you would love them. PLease let me know how yours turn out. Oh wow...you sure know how to make cupcakes. They look simply divine! So tasty!!!! Oh Becky! !these little beauties look amazing!!! I absolutely LOVE the flavor and have bookmarked these - YUM! I'm not big on cakey things, but these are definitely calling my name. Oh how I love how you dressed them to the hilt! Amazing! Thanks so much for linking up at Weekend Potluck.